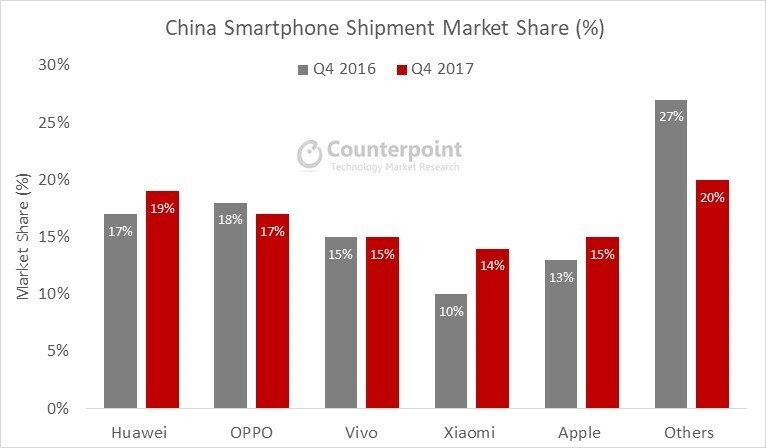 According to the latest research from Counterpoint’s Market Monitor service, smartphone shipments in China were down 1% annually in 2017, however, the sell-through was up 5% annually. In 4Q 2017 particularly, the market was down 5% YoY but increased 5% QoQ driven by vendors launching big promotions for Singles’ Day in November and 12.12 in December. 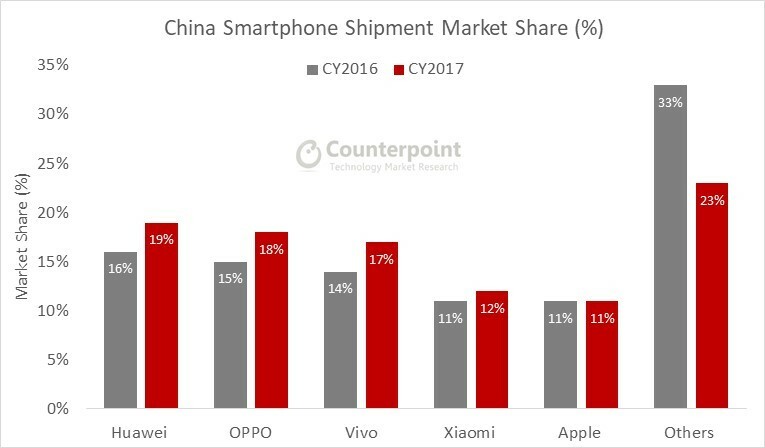 Commenting on the competitive landscape, James Yan, Research Director at Counterpoint Research commented, “Compared to 2016, where the smartphone market in China enjoyed robust annual shipment growth of 8%, 2017 was a difficult year for vendors as we saw a slowdown in shipments in the world’s largest market. The slowdown in sell-in volumes in 2017 can be attributed to strong shipments in 2016 by growing brands such as Huawei, OPPO and vivo to match the aggressive marketing spend in the second half of 2016. Hence, during most of 2017 we saw a greater effort from these brands towards clearing the accumulated inventory with which they exited 2016 rather than focussing purely on new shipments. 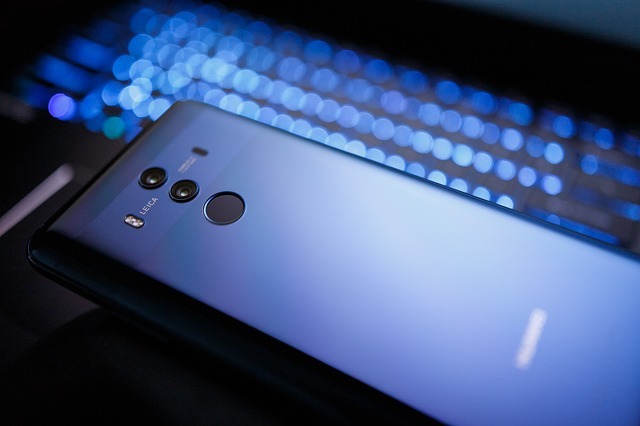 Huawei secured the leading position in the Chinese smartphone market during the final quarter of 2017 (+8% YoY) and for the full year 2017 it registered 19% YoY growth. This allowed the world’s third largest smartphone brand to capture 19% share of the smartphone market, its highest ever for a full year. 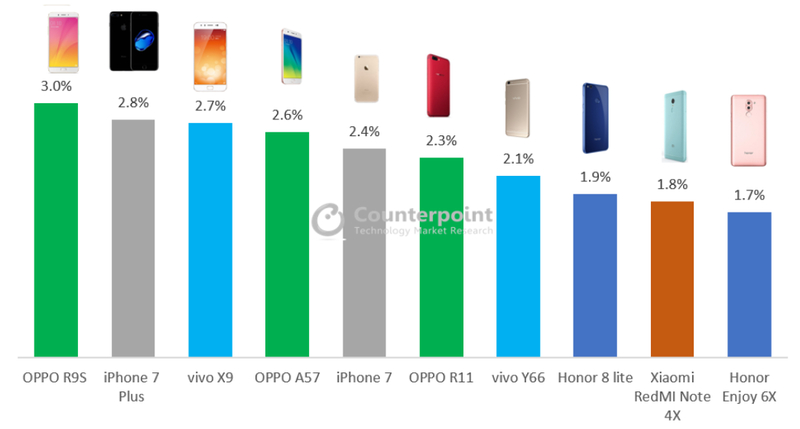 OPPO and vivo were the second and third largest brands in China in Q4 2017 and for the full year 2017, capturing a combined more than a third of the smartphone market. For the full year 2017, OPPO and vivo were able to grow faster than the overall market and increased their market share to 18% and 17% respectively. However, during Q4 2017, we saw OPPO and vivo’s growth slowing down considerably, as they faced tough competition from Xiaomi and Huawei. On the other hand, Xiaomi made a strong comeback in 2017 with a more focused portfolio and aggressive channel expansion strategy beyond online channels to rekindle demand in its home market. Xiaomi’s marketshare jumped to 14% and it was the fastest growing brand (+31% YoY) during Q4 2017. This helped Xiaomi to grow its annual market share to 12%, inching past Apple. While the big four Chinese brands have completely dominated the market, together controlling almost two-thirds of the smartphone market, all eyes are on Apple to see if the new iPhone X can drive the “super cycle” Apple has been looking for in one of its most important markets, China. Apple’s market share in China dropped for the first half of 2017 but started picking up during the second half of 2017. Apple’s strategy to sell competitively priced older iPhone models such as customized iPhone 6 32GB for the China market drove some uptick for Apple. In addition, we are seeing sales of the new iPhone X and some 8 series models beginning to gain some traction during Q4 despite the high-ticket prices. Commenting on Apple’s performance and opportunity, Associate Director, Tarun Pathak, highlighted, “China saw some strong traction for the iPhone X demand in December but still lower than expected, mostly due to supply issues or the high price. The Chinese holiday season in Q1 2018 will be a critical period, setting the tone for the vendor’s full year outlook. The comprehensive and in-depth Q4 2017 Market Monitor is available for subscribing clients. Please feel free to contact us at [email protected] for further questions regarding our in-depth, latest research, insights or press enquiries.